May is Water Safety Awareness Month. Blue is the awareness color for Water Safety. Available in 14 cancer and cause awareness colors. Measures about 1" tall and 1" wide. Removable metal military clutch back. 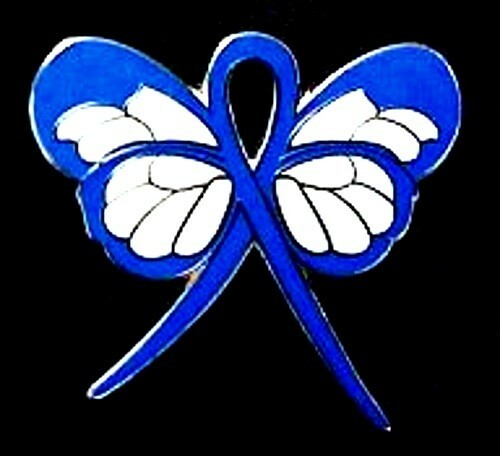 Water Safety Lapel Pin Blue Awareness Ribbon Butterfly May is Water Safety Awareness Month. Blue is the awareness color for Water Safety. 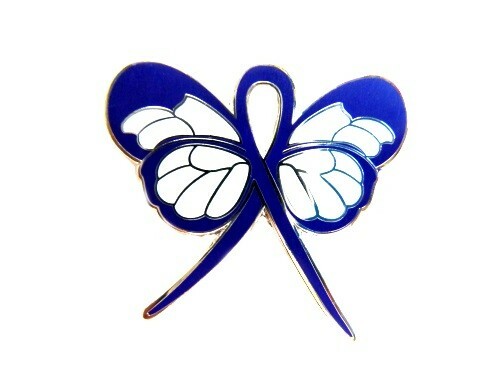 Exclusive design by: Lapel Pins Source Available in 14 cancer and cause awareness colors. Measures about 1" tall and 1" wide. Removable metal military clutch back. Attention to details and fine white gold plating enhances the beauty. 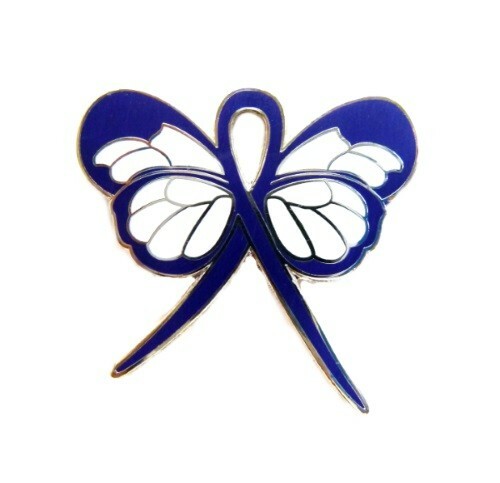 Beautiful enameled butterfly ribbon in blue, white and silver. Not just a lapel pin but a piece of jewelry. 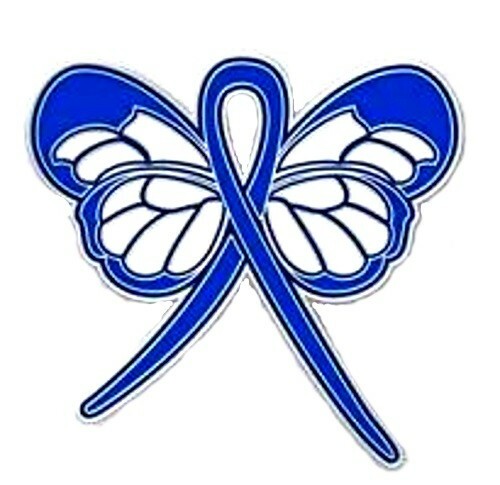 Great way to show your support and promote Colon Cancer awareness!! Give the gift of Hope and Inspiration! Great for Relay for Life events and any awareness walks and other awareness events. 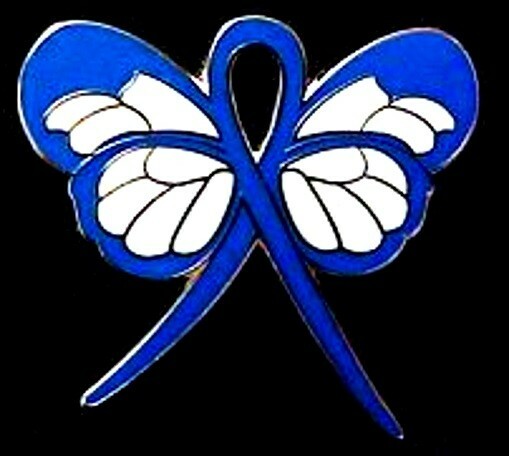 Perfect awareness pin for Cancer patients, chemo patients, survivors, caregivers, family, friends, medical staff, and supporters. Clean with silver polishing cloth for lasting beauty and wear. The Best Protection is Early Detection. Wholesale and fund raising discounts available. Custom designs can be made specially for you. Perfect fundraising pin. We donate a portion of the proceeds to non profit organizations for research. The American Cancer Society Relay for Life helps many cancer patients and their families and is a valuable resource. Call 24/7 with any questions you may have about cancer. Toll free number is 1-800-227-2345. Help and support are waiting for your call. We are proud supporters of the Relay for Life and love fundraising in hopes that someday we will help to find a cure for cancer. Together we can and do make a difference. For Customer service Monday through Friday 10am to 5pm EST call 1-888-874-6463.
approx. size 1" tall and 1"